What is Spider-Man star Tom Holland doing on the set of Doctor Strange? Executive producer Louis D'Esposito has been tweeting out images from the latest Marvel Phase Three adventure, and today, he shares an image that features the new Peter Parker huddled up with director Scott Derrickson. Does this mean he's in the movie? Probably not. But who knows? We haven't heard anything about Peter Parker and Doctor Stephen Strange exchanging herbal tea recipes, so we're pretty sure Tom Holland is just visiting the set. But a Spider-Man cameo isn't being completely ruled out. We know that this new take on the superhero will be introduced in Captain America: Civil War before he makes his bold entrance in his own 2017 standalone movie. That news was long rumored, and only just confirmed within the last week. So despite the photographic evidence here, if Tom Holland is stopping by to say hi in his second Marvel movie, we probably won't get a firm answer for several more months in regards to a Doctor Strange cameo. The more likely scenario is that Tom Holland, a young comic book fan, is utilizing his leading man status to get a first hand look at everything else Marvel has coming down the pipeline. Wouldn't you be doing the same thing? And this isn't the first time we've seen the young actor pop up on a set. He was last seen visiting members of Suicide Squad. And we're pretty confident that Spidey isn't going to swing by to hang with the Joker when that DC Comics epic hits screens next summer. Production has been under way on Marvel's second Phase Three movie Doctor Strange since November. Executive producer Louis D'Esposito recently released an image from set that revealed a door featuring the Seal of the Vishanti, hinting that he was standing in the Sorcerer Supreme's Sanctum Sanctorum. Today's other new photos show the EP with the director of photography Ben Davis standing inside a mystical temple, along with production designer Charles Wood and the recently announce co-writer C. Robert Cargill. Scott Derrickson, known for such thrillers as Deliver Us from Evil and Sinister, is directing Doctor Strange. Jon Spaihts, who wrote Prometheus and the upcoming Untitled Mummy Reboot, is penning the script for this fantasy adventure. What do you think? 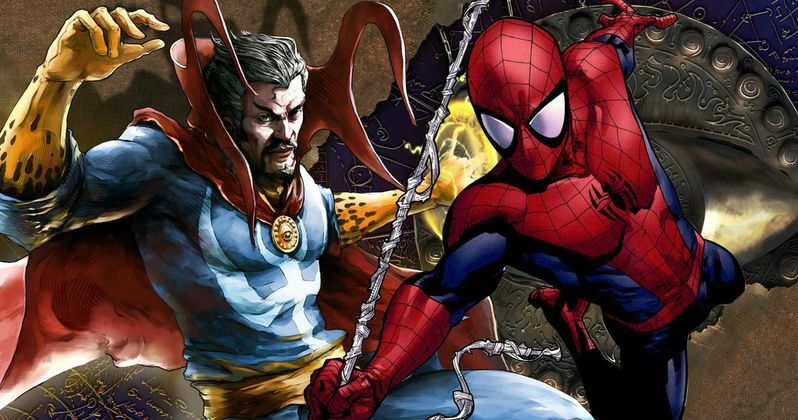 Is Spider-Man joining Stephen Strange for his second appearance in the MCU? Take a look.